TextOne is natively multi-brand. It’s a white label service & app that is simple, nice and runs perfectly on various mobiles. It’s an open network approach and relies on open standards. One to one chat is so old. 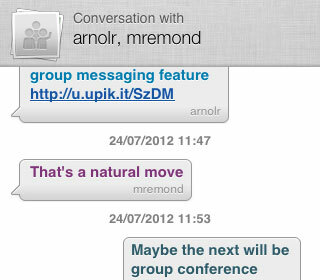 With the group messaging feature, you’re able to communicate and share photos with a group of contacts, friends or colleagues instantly. You’re not always using TextOne. With full support for Apple and Google push platforms, TextOne never missed an important message either in real-time or when switched off! 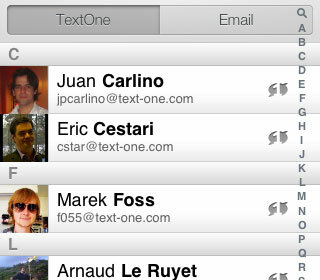 If your don't know who of your friends or colleagues are using TextOne, it's easy to find them instantly in the contact list or start discussing with them using their email address. Yes it’s possible in TextOne. 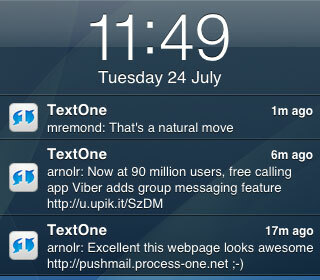 Send a message by TextOne to their email and receive their answer in TextOne. Magic, right? You need to block OTT communication services because of network effects? 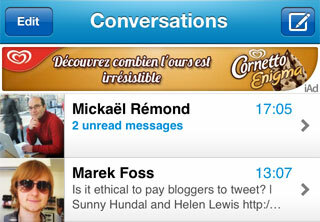 You also want to find some new business models with mobile ads? Everything has been learned on TextOne! 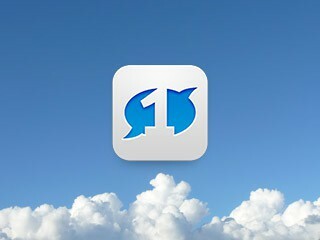 Your contacts, photos, communication history are stored in the Cloud. Don’t be afraid, everything can be found, even if you change your mobile. Now, TextOne can be a part of your business!